The meeting will be held from 6:30pm to 8:00pm at John B Day elementary school. The Bayfront Advisory Committee will hold their monthly meeting on Thursday June 20th at 3:30pm in the VB Resort Hotel and Conference Center. The City of Virginia Beach’s Department of Public Works will present the plans for a large stormwater project that covers neighborhoods east of the Lesner Bridge along Shore Drive. Cape Story residents are concerned that the City’s interim plug is in the wrong spot and will not protect all 40 homes in the tidal flooding zone. FEMA funding for raising floodprone homes. Is your home being flooded by every high tide storm event? If you meet the following severe repetitive loss criteria, FEMA will provide 75% of the cost to raise, relocate or purchase your home. (b) For which at least two separate claims payments (building payments only) have been made with the cumulative amount of the building portion of such claims exceeding the market value of the building. For both (a) and (b) above, at least two of the referenced claims must have occurred within any ten-year period, and must be greater than 10 days apart. Cape Story requests action from City to prevent flooding of short streets. Todd Solomon has sent you some photos of the high tide flooding that occurred Monday Oct. 29th around 10:30am high tide cycle for Long Creek. The water level above the SW grate at the about 14 inches and Todd’s estimates for the height of the high tide for this event is 7.0 feet when compared to the 2009 Nor’Ida and Todd lives on First Landing. At least 8 homes between Calvert and Wake Forest had water come into their homes. The one at the end of First Landing Lane had at close to 18 inches and will need dry wall and insulation replaced. All of the flooding for these homes was a direct result of the tidal surge coming backwards through the First Landing outfalls in the Cape Henry canal. Based on Todd’s and neighbors observations during the storm, water from the Cape Henry canal never breeched the roadway crest at the intersection of Admiral and First Landing. Water entered the ditch along the trail and filled the low lying areas and then flowed west toward Wake Forest. The maps produced after the 2009 event were very close to what actually happened. 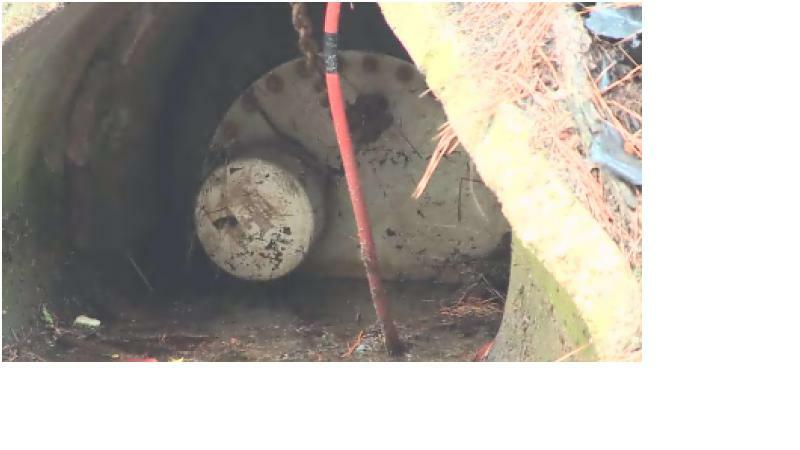 Based on the success of the backflow prevention device in Ocean Park, as President of Cape Story by the Sea, I formally request once again that some type of device is installed in the First Landing outfalls ASAP. The flooding damage as a result of Sandy could have been prevented. Based on past experience from 2006, 2009, 2011 and 2012, a backflow device will function satisfactory for events that have a high tide less than 8.5 feet. This should be acceptable for most events. Of course, if a Cat 2 storm hits us directly, we’re all in trouble. Nothing will save us and we know that. Please let me know what the plans will be moving forward and when we can expect action on this request. I know there is a larger plan for the entire Shore Drive area, but this solution should cost less than $100k and be installed before the next nor’easter. I would also request and update on the work being done at the Poinciana Pump Station. The City hired Parsons Brinckerhoff to perform a study of storm water improvements for Cape Story. The following link will take you to the DRAFT of this study. 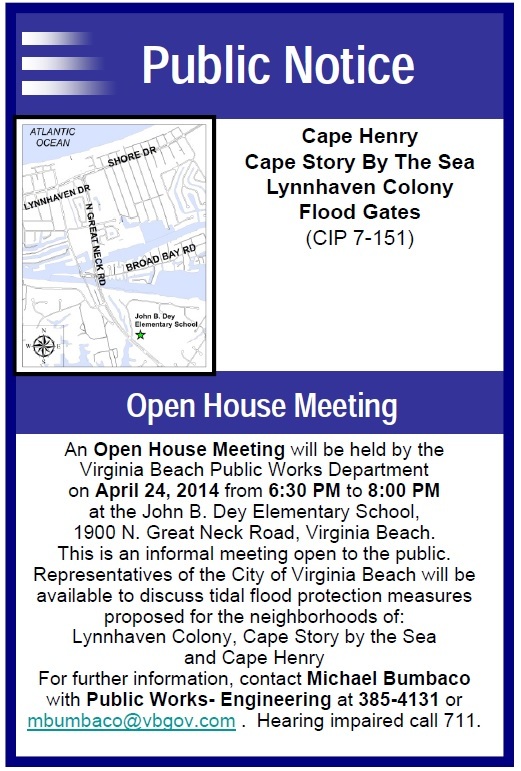 You will find the suggestions for Cape Story in the “Draft Shore Drive Area Flooding” link on the City’s page. You can also see the proposed improvements on the Cape Henry-Cape Story map link.